The squat has always been the best overall leg exercise working all of the muscles of the lower body. Until now, the only way to perform this great exercise was to use a barbell, which is difficult and can be dangerous due to lack of balance. 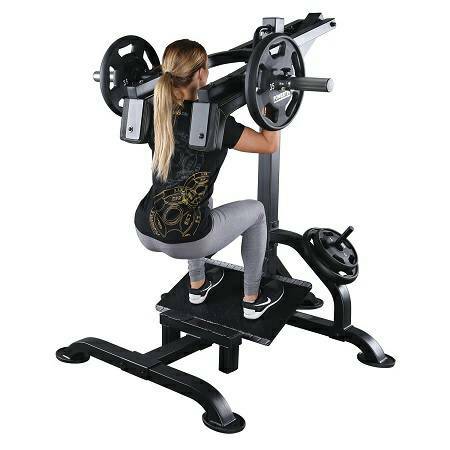 The Powertec Leverage Squat/Calf L-SC machine duplicates the precise pattern of the squat but instead utilizes a lever arm rather than the bar. With the Powertec Leverage Squat Calf L-SC you receive the benefit of the proper feel and natural resistance of a barbell with the control and safety of a machine. 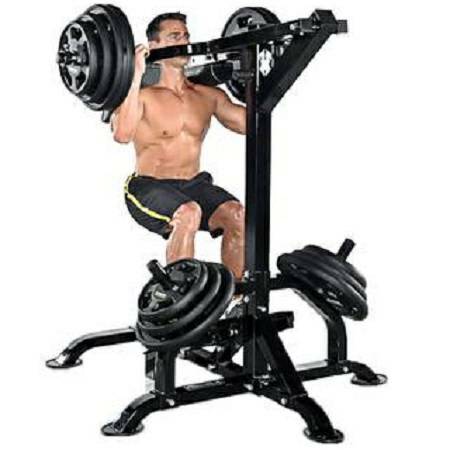 The Powertec Leverage Squat Calf L-SC incorporates a "Patent Pending" start / stop handle that allows you to begin and finish the exercise in the top position. 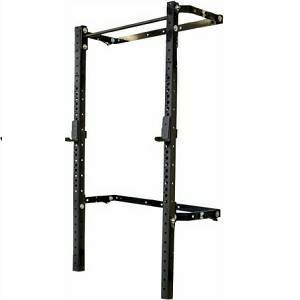 There are two large diamond plate platforms for angle of flatfooted squats. The angle position really allows for perfect and comfortable motion eliminating much of the stress on the lower back. The removable calf block comes standard with the unit and allows for standing calf raises to be performed. A proper leg workout not only strengthens the glutes, quadriceps, hamstrings and calves, it also works the cardiovascular systems and burns fat.The Powertec Leverage Squat/Calf L-SC builds form into function and value into a superior modular strength training system. 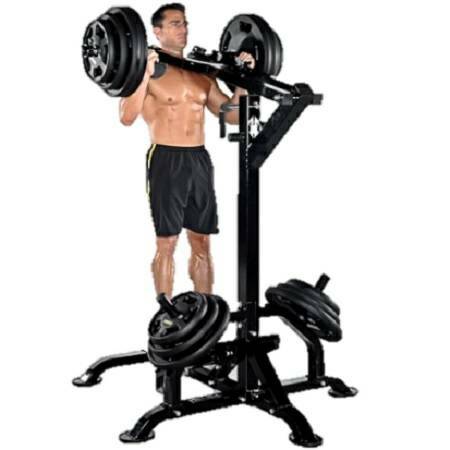 The Powertec Leverage Squat/Calf L-SC is designed to provide an intense workout while eliminating strain, the Powertec Leverage Squat/Calf L-SC pieces are hard to beat. Easy and convenient step in entry makes getting started a breeze. Thick, comfortable DuraFirm pads reduce fatigue and discomfort allowing you keep working out. Rock solid support and stability is delivered via heavy-gauge steel frames with all-4-side welded construction. 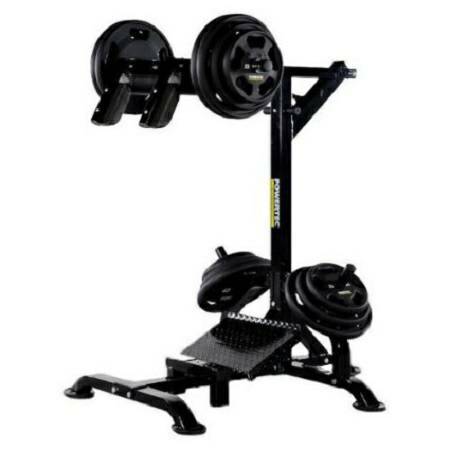 The Powertec Leverage Squat / Calf L-SC is specially designed to focus on your calves, glutes, hamstrings and quads. 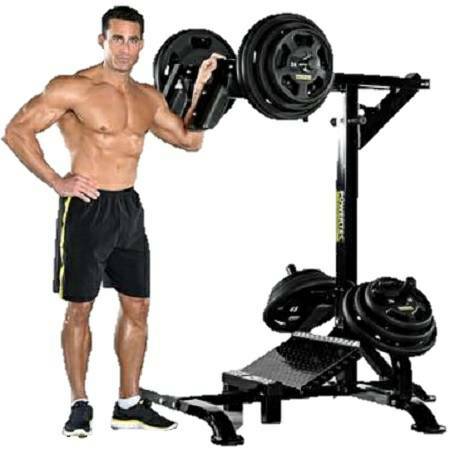 The Powertec Leverage Squat/Calf L-SC is one of the best ways to work your calves, glutes, hamstrings and quads in a safe and efficient manner. Setting the foot plate at the correct angle and properly positioning the plate load, all stress and pressure is taken off the lower back and knees. The resistance is focused totally on the thighs to drive the motion. An innovative Slide Handle bar is incorporated that allows the user to start and stop the exercise in the top position. Leverage Advantage: The lever arm drives the exercise. 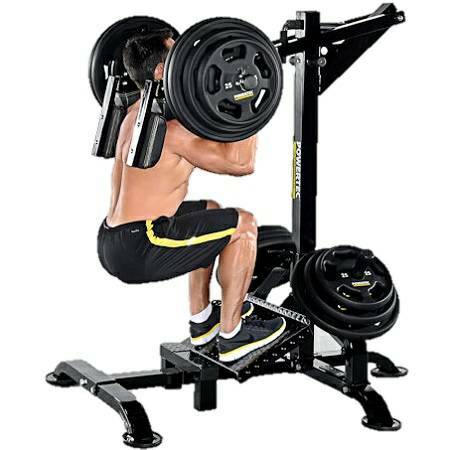 Weight plates are loaded directly onto the lever arm which simply replaces the barbell thus providing the natural feel and resistance of free weight with the safety and control of a machine. Perfect Motion: By setting the foot plate at the correct angle and properly positioning the weight plate load, all stress and pressure is taken off the back and knees. The resistance is focused totally on the thighs to drive the motion. Safety Start / Stop handle: An innovative slide handle bar is incorporated that allows the user to start and stop the exercise in the top position. There is also a fixed safety stop position built in. - Squat Lever Arm: 500 lbs.